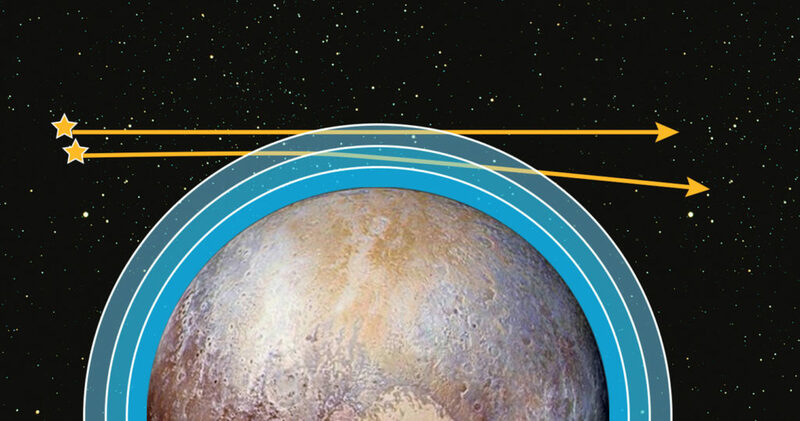 May 17, 2016 – Scientists on NASA’s New Horizons team say the spacecraft succeeded in observing the first occultations of Pluto’s atmosphere by ultraviolet stars, an important goal of the mission’s Pluto encounter. These data, stored on New Horizons’ digital recorders since last summer’s encounter and recently transmitted to Earth, confirm several major findings about Pluto’s atmosphere. Approximately four hours after New Horizons made its closest approach to Pluto on July 14 – when the spacecraft was about 200,000 miles (320,000 kilometers) beyond Pluto – the Alice ultraviolet spectrometer instrument on board the spacecraft “watched” as two bright ultraviolet stars passed behind Pluto and its atmosphere. The light from each star dimmed as it moved through deeper layers of Pluto’s atmosphere, absorbed by various gases and hazes. Much like the solar occultation that Alice had observed a few hours before – when it used sunlight to make similar measurements – these stellar occultations provided information about the composition and structure of Pluto’s atmosphere. Both stellar occultations revealed ultraviolet spectral fingerprints of nitrogen, hydrocarbons like methane and acetylene, and even haze, just as the solar occultation had done earlier. The results from the solar and stellar occultations are also consistent in terms of vertical pressure and temperature structure of Pluto’s upper atmosphere. This means that the upper atmosphere vertical profiles of nitrogen, methane, and the observed hydrocarbons are similar over many locations on Pluto. These results confirm findings from the Alice solar occultation, that the upper atmospheric temperature is as much as 25 percent colder and thus more compact than what scientists predicted before New Horizons’ encounter. This also confirms, albeit indirectly, the result from analysis and modeling of the Alice solar observation that the escape rate of nitrogen is about 1,000 times lower than expected before the flyby.